During the whale season you can’t miss a trip out to sea to visit them. The Southern Right Whales cannot breathe through their mouths and have to go to the surface to catch air through their 2 blowholes that sit on top of their head. For this reason, they are commonly spotted swarming along the top of the big blue waters. They are slow swimmers, but highly versatile, as you will witness when the shoot clear out of the water’s surface and come crashing down with awe-inspiring splashes. They must be happy there in the Peninsula and seem to appreciate their company because they never hesitate to put on a show for their new group of visitors. The Southern Right Whale is mostly black or grey in color with distinctive white and/or brown patches on their head. 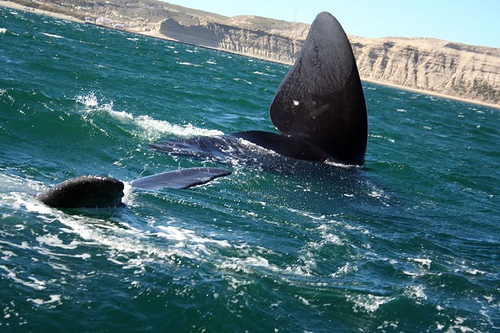 However, you will find a unique specimen of this whale in Peninsula Valdes. There is one young albino whale that was born with a skin pigmentation problem and is a rare shining white color. It typically clings to its mother in the water and is easily identifiable. The whales are beautiful creatures and will give you a unique whale-watching experience that you will never forget. This page rendered in 0.123 seconds.